in Coroico, Los Yungas, Bolivia, on June 25, 2016. 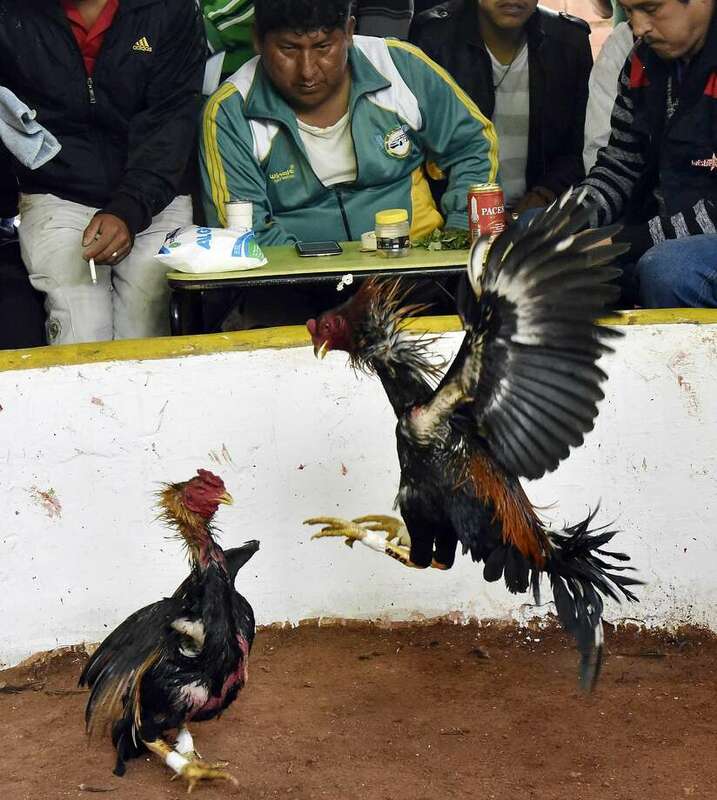 Cockfighting is traditional in rural Bolivia during the patron saints festivals. Cockfighting is a crime in all 50 states, but it may not be the type of gravely immoral offense that requires deportation of any noncitizen who commits it, a federal appeals court in San Francisco ruled Tuesday. The Ninth U.S. Circuit Court of Appeals overturned a 2013 decision by the Board of Immigration Appeals, the nation’s top immigration court, that classified cockfighting as a crime of “moral turpitude.” That made convictions grounds for deportation even for legal U.S. residents who were noncitizens. The immigration court’s decision also meant that residents in the country illegally could be barred from claiming exceptions from deportation, such as family hardship. The case involved Agustin Ortega-Lopez, who entered the United States illegally from Mexico in 1992 and lives in Oregon with his wife and their three U.S.-born children. He pleaded guilty in 2008 to a misdemeanor charge of cockfighting in which the court said he had played a minor role, described by his lawyer as providing transportation to the scene of the fight. He was sentenced to probation, without jail time. Placed in deportation proceedings, Ortega-Lopez sought a reprieve under a federal law covering longtime residents who had no serious criminal record and whose U.S. citizen relatives would suffer serious hardship. But an immigration judge ruled him ineligible, saying any type of staged animal fighting was a spectacle involving “the intentional infliction of harm or pain on sentient beings,” which the judge compared to innocent children. The Board of Immigration Appeals upheld the judge’s ruling, but the Ninth Circuit court told the board Tuesday to reconsider the case and what might be an overly broad view of moral turpitude. State governments and Congress are entitled to classify cockfighting as a crime, though it is legal in U.S. territories such as Guam, the Northern Marianas, the U.S. Virgin Islands and Puerto Rico, Judge John Owens said in the appeals court’s 3-0 ruling. But he said crimes of moral turpitude generally involve either fraud or deliberate harm on “a protected class of victim,” and it isn’t clear that cockfighting qualifies. “The crime at issue involving harm to chickens is, at first blush, outside the normal realm” of offenses so serious that they involve moral turpitude, Owens said. Next Post Hypocritical to condemn cockfighting sports. Society kills & eats 9B chickens a year.